Earlier topic: are treadle shafts symetrical? We want to be able to score our greeting cards in-house. Does anyone use a hand scoring machine? What are your thoughts? I have been looking into the Lassco Wizer. If their scoring machine is as great as their corner rounder then I think it could be a good fix. Why don’t you score them on the press? Thanks for the comment. Could you ellaborate? We use a Vandercook with French 100lb paper. Then we cut the cards down. I have seen some pretty decent die cut setups for the Vandy, but wanted to see if there was an easier way then setting up the die jacket and scoring. Hmmm…you caught me off guard. I thought since your website shows platen presses, that you were using them for this. I have never scored on a Vandercook, so am not qualified to offer information there. Maybe someone else will comment regarding scoring on a Vandercook. 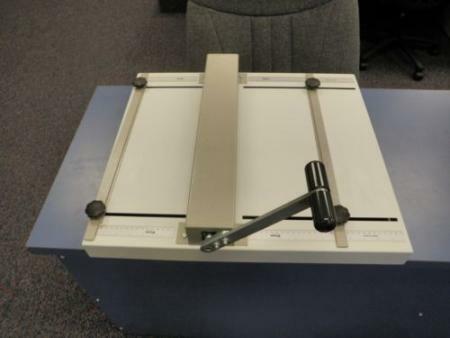 Could you use one of your platen presses? Then you could take the rollers out, lock up a piece of scoring rule, put matrix on the tympan for the rule to score against, and score the cards the opposite way that you intend to fold them. Matrix and scoring rule are both available from NA Graphics (and others), and I’m sure they could recommend the correct height of the scoring rule that you should use for your particular application. I think creasing is a better way to go than scoring. The look of the fold is more professional, and it works on almost any weight paper. I use the Fastbind brand, but, there are many other more common brands available. Thank you for the comment. I think that could be a great idea. Thank you for the response. We own a retail store which is one half stationery store and one half letterprss studio located on Old Town Alexandria. My wife normally cranks out small runs of greeting cards on our Vandercook. She wont use the CP Press. Boo! ha. I may looking into the die jacket from NA. I was looking for something simple to do like 5 cards at a time. I’ll jump in here and say that I do my scoring (and printing) on a Poco Proof Press. The cylinder press seems to be ideal for me. In most cases I even print and score in the same pass!!!! Since I am hand-inking my form with a brayer, I simply ink the type/image on each side of the score without getting the ink on the brass rule that I score with. Should I inadvertently get ink on the rule I simply have a rag next to me that I can wipe it off with before I pull the impression. The brass rule that I use is 3 pts. thick with a 1 pt. rule at the top. Since my sets of brass rules only go up to 36 picas in length, I just use two of them at the proper length that I actually need if the score is longer. The form is locked up in the bed of the press so that the score is going to be perpendicular to the cylinder so that the cylinder rolls down along length of the rule. I can them pull a quick impression onto the tympan and see eactly where the rule will be. I then apply masking tape to the tympan on both sides of where the rule will impress the stock, leaving maybe 1/32” gap between the tapes. This creates a “valley” for the rule to dig into and puts more “punch” into the score. If you need more depth to your score just add another layer of masking tape. I know that this is slow and laborious, but that’s the way I do things around here. I generally use this method to score 65 and 80lb. cover stock and it works marvelously for me. This also assumes that you have a good amount of clearance for the score away from your printed image. When the ink has dried, I then hand-fold the pieces. When that is done I take them to one or more of several copy-presses that I have and put a 1 to 2” stack of them in there and clamp them down. If you can leave them clamped overnight, that is ideal. This crushes them down even flatter, AND the length of time they are being clamped allows the “memory” in the fibers on the fold to assume this new position and stay that way. The next day I take the piles out of the copy-presses and take the cards to the cutter for the final trim. It is MUCH better to trim AFTER folding than to trim and then fold and HOPE that your edges match. Hope all of this makes sense and might be useful. Thanks for the comment. I have a Poco which is just sitting my the corner of my shop! I have never thought about using it to score. I am actually about to list it for sale on Briar as I have not been using it. To me it would be easy to score on the Vandercook, get a scoring rule lot it up as if it was one line of type. Raise the inking rollers so they do not touch the rule. And increase the packing and score the cards. To me it would be easy to score on the Vandercook, get a scoring rule lock it up as if it was one line of type. Raise the inking rollers so they do not touch the rule. And increase the packing and score the cards. Juratovic, Scoring rule plus creasing matrix.= Cake walk. & creasing matrix. Wagner Die Supply has the stuff. Any score or crease should be done one card at a time. Get your wife over on that press. Hope to see you guys soon. To me there is one problem with scoring on a Vandercook. It is a little easier if the paper is long enough, but because what you are going to score the paper will often sag a bit from the point where the cylinder is over the printing area to where it actually contacts the scoring rule. If you turn it side ways (scoring down the rule) you cannot score that first half inch. So you have to trim after scoring. To me the most serious argument for scoring on the platen is the ability to use creasing matrix which gives you the absolute best score which can be quite important when using soft paper which letterpress well. You can get creasing matrix from NA Graphics for varying thicknesses of paper. Be sure to use the right one. Scoring rule comes in various heights. Using creasing matrix at the same time as printing, it would be best to use a rule lower thaan .918”, something that won’t ink and would be matched to the additional thickness of the scoring matrix. On a cylinder press the grain should be run across the cylinder and so should the score. At least you should be using the same guide edges in printing and scoring, and running the grain of the paper around the cylinder is not the best practice in print or score: it will slap more and there is no way to get around image stretch. One advantage of scoring on a platen is that you can run the grain either way and even extend the score into what would be needed as gripper bite on a cylinder press. Plus the serious increase in speed on any platen, even if treadled. Printing 918, (23.30mm) use 890 (22.80) crease rule and standard matrix and if your rollers are set correctly you can do in the print pass. scoring is a different process and a bit of a dog job .Not so easy to do in the print pass. This is a really interesting topic. I enjoyed reading all the ways folks accomplish the job. In the research I did to determine what equipment I would purchase, I learned one particular that pushed me toward creasing over scoring that I haven’t seen mentioned. I also confess I tend to be attracted to single purpose machines. So, I purchased a separate tabletop machine that creases really well. It’s always ready for any dimension crease on any size paper. The particular that pushed me to creasing rather than a scoring was learning a scored card has to bend 180 degrees and a card that has been creased bends less than that. This feature reduces cracking in the fold which can really help on certain papers. It took me awhile to realize the creased fold puts the bump on the inside, not the outside of the card. Seemed backwards until I understood the theory of the fold. John, can I ask what you use? I’m intrigued by some of the relatively inexpensive manual creasers I’m seeing. I’ve used a little Fiskars machine for scoring, but it leaves much to be desired, even for shorter runs. And with a Lettra cover stock, and I imagine other papers with a good deal of cotton content, I get a lot of tear out. Have you tried any stocks of that sort with your machine? I use a Fastbind creaser. It is $695 new, but, sells for about $200 used on Ebay. I checked before responding and although two sold recently, there are none for sale at the moment. My philosophy is to purchase used higher quality machinery rather than new lower quality. I saw the other machines you mention and because they are less money new than the Fastbind is used, I decided to go with the more expensive piece of equipment thinking it should be better. I have never used any of the cheaper ones being sold, but, I am very happy with the Fastbind which I have had for about 4 years. It is made by the Maping Co. in Finland, not in China. Keep in mind, using a dedicated creaser is an extra step and is a one at a time process which some would find unacceptable. I just am happier going slower getting consistently good results, because I print short runs for fun and make my money restoring and selling presses. Thanks, John! I’m with you on all fronts. $200 for a Fastbind is a great deal. I’ll keep an eye out for one of those for sure. I think it’s just the thing I’d like. Perhaps that’s my next equipment purchase for the shop. I appreciate the info.